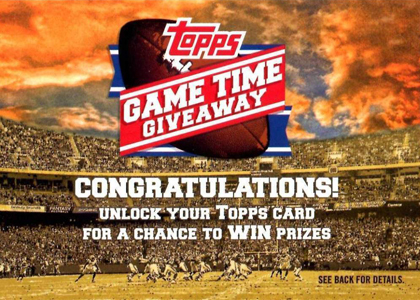 The 2012 Topps Football Game Time Giveaway is sending collectors back to their computers for a new virtual sweepstakes. Those busting packs of 2012 Topps Football have likely found redemption cards for the Game Time Giveaway that prompts them to go online and enter the code on the back of the card. Building off of the 2011 Topps Super Bowl Legends Giveaway, the new program offers new exclusive Game Time cards and football memorabilia giveaways. Every Game Time Giveaway code unlocks either a virtual token or an exclusive Game Time football card. The tokens can be used in a virtual game that collectors can use to gain points to win prizes like autographed cards, helmets and footballs. Game Time match-ups will be based on results from NFL games. Collectors compete for weekly prizes and in seasonal contests. Game play coincides with the kickoff of the 2012 NFL season in September. Codes must be entered by January 31, 2013 at 11:59 PM EST. The 2012 Topps Football Game Time cards have a die-cut design. Rookies, veterans and legends are pictured. The set has a total of 50 cards. Each card has a regular parallel and a one-of-one Red parallel. Odds for Red parallels are 1:30,000. They are also considered prizes. Game Time cards fall at a rate of 1:14 codes entered. What this means is that the weekly leader will get an Andrew Luck autograph card, the second place finisher get Robert Griffin III and so forth. Collectors can take delivery of their cards, but they must pay for shipping. The cost is $2.92 for the first card and $0.53 for each additional card. Cards must be ordered by March 4, 2013. Collectors do not have to pay to have prize cards (Red and Autograph Cards) delivered. All 32 teams have a virtual token that can be unlocked. Every week of the NFL regular season, collectors can choose to play their token (if the team is playing). They get a point for every point the team on the token scores. Collectors can play up to five coins per week. For potentially high-scoring games, virtual coins can be played for both teams in a single match-up. Individual tokens can only be played once, although it is possible to get multiple tokens of the same team. The ten players with the most points at the end of each week get the autograph cards listed above. At the end of the season, the top five players win an autographed helmet. The next five get an autographed football. 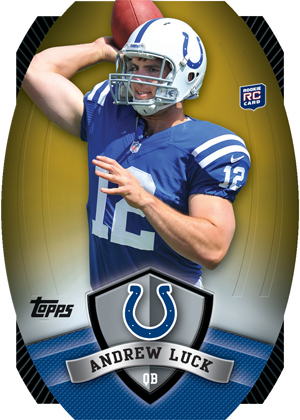 The first five collectors to unlock all 32 virtual coins get an autographed Andrew Luck card. The following five people get a Robert Griffin III autographed card. 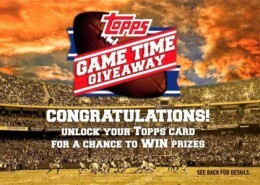 A complete list of 2012 Topps Football Game Time Giveaway rules and fine print can be read here. UPDATE (August 23, 2012) - Post updated to reflect official launch of the Game Time Giveaway website. Tom Brady-Rob Gronkowski 2012 Topps Game Time REDEMPTION REFRACTOR DIECUT RARE! RUSSELL WILSON 2012 TOPPS GAME TIME GIVEAWAY DIE CUT ROOKIE RC #16 Great Shape ! I received 3 game time cards with only 10 codes entered…and they are Cam Newton, Kendall Wright, and a gold LeSean McCoy!! Lucky!! Is there a checklist for the Game Time Cards? I had six of the cards, but two of them dropped off of the Game Time site. I did not request delivery, so there must be a problem with the site. My cards are back, it must have been a temp clich. I would still like to have a checklist for the Game Time cards, any idea where I can find a checklist? Topps website does not have a checklist for these cards, as usual! Randy (ID 88167) � If you’re on Twitter, you can contact them at @ToppsSupport. Also, if you’re able to call them, you may be able to get an answer from someone at their CS department. HOW DO I REGISTER MY GAMETIMEGIVEAWAYS CODE.I HAVE DONE ALL I KNOW AND CANT GET IN. Im with Benny as far as the Game Time run around goes. I chuck em in the round file. where do you enter game time codes? 2012 Topps Football HOBBY Box 1 Auto Relic (Andrew Luck Wilson Rookie Card RC)?